1. Can I do something to avoid the tomato blight (early and/or late season) and what should I do if my tomatoes (or potatoes) are infected? For tomatoes, try growing blight resistant varieties and space plants 30" to 36" apart for good air circulation. Destroy infected plants ASAP to limit spread of the disease which needs living tissue to survive - plants should go into trash bags and taken to a land fill - not the compost pile. Organic treatment requires that a copper fungicide be applied before the disease appears and every 5-7 days in persistent wet weather. Each year, plant breeders come out with varieties that are more resilient to blight. Of the varieties we grow, we recommend Juliet and San Marzano Gigante III. They both seem to have naturally occuring resistance to the disease. For potatoes, try planting potatoes in hills, rather than trenches for better air flow around foliage, and cut off infected leaves on a hot, dry day before the blight moves to the stem. Wait 2 or 3 weeks to dig tubers to reduce the chance for spores in the soil from infected foliage and in potentially nicked tubers. Also, make sure that you are buying potato seed that is certified disease free and comes from a reputable source. Thanks to Ann Hazelrigg, Plant Pathologist, UVM Extension, above adapted from "2011- Late Blight Reappears in Vermont". We are so excited about our new selection of plants! Many of you have requested a wider array of edible and ornamental landscape plants, and we are happy to oblige. Below you will find a few of the new plants we love. Descriptions, growing information, and suggestions for companion plants can be found under "Our Plants". 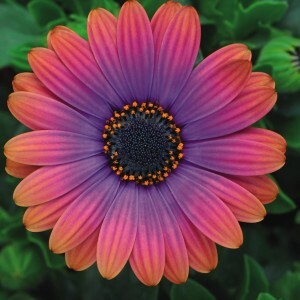 'Zion Copper Amethyst' Osteospermum: Upright, daisy-like annual flowers in awe-inspiring amethyst/pink/orange. Plant in part to full sun 12-18" apart. Slightly trailing habit. Low maintenance, no deadheading required! Does well in containers. Allow top of soil to dry out between waterings. 'Holy Red and Green' Sacred Tulsi Basil: Striking purple and green leaves have a musky scent and mint-clove flavor. Tulsi basil has been sacred to Hindus for at least 3,000 years. It has excellent medicinal properties as a stress reliever and anti-inflammatory and makes a refreshing tea. Allison, our seed master, says it makes a wonderfully-scented oil for salves and skin creams. 'Reliance' Grape: A very hardy, vigorous variety that produces clusters of beautiful pink seedless grapes excellent for fresh eating as well as jellies and juices. Plant in full sun and moist, well-drained soil where the plant will have at least 10’ of climbing space. Prune in winter, train in summer. Makes a great privacy screen or seasonal shade. 'Banana Cream' Leucanthemum: An unusual perennial daisy that opens lemon yellow and slowly turns white as it matures. Full flowers bloom in abundance all summer. Ideal for cut flowers due to long, straight stems and extended shelf life. Looks lovely with just about anything, but especially lavender, liatris, and gaillardia. Very vigorous plants multiply easily, making a great filler. Plant in full sun 18-24” apart. Attracts butterflies. 'Niger' Black Mondo Grass: A compact, clumping grass-like plant. Foliage turns jet black when grown in full sun. Small light purple to white flowers on short stalks appear in early summer and give way to black berries in the fall. Plant in full sun to part shade 12” apart. Pair with succulents, lobelia ‘Fan Scarlet’, or Lamb’s Ear for dramatic color and texture combinations. "Early in 2001, while having lunch with Julia Child at Bernardus Lodge in Carmel Valley, California, I told her about my having in my tomato seed trials several un-named varieties. I followed by asking her, "If I'm able to grow an heirloom tomato that's good enough to name after you, what kind would you like it to be?" I suspected she would say, "Red", or "Beefsteak", or "Yellow." However, after just a moment's hesitation, Julia looked at me and replied, "Tasty, my dear"
"'Julia Child' is an open-pollinated, heirloom tomato. The tall, indeterminate, potato-leaf plant produces lots of 4-inch, deep-pink, lightly-fluted, beefsteak fruits that have the kind of robust tomatoey flavors and firm, juicy flesh that invites tomato feasting and seed-saving. It's not a simple, sugary sweet variety, but has a bold, straight-forward character in its taste, with more than enough acidity and earthy nuances to balance its sweet, fruity flavors." 'Paul Robeson': A well loved tomato on many people’s “favorites” list. A “black beefsteak” with dark red fruit tinged with black, brown and purple flesh and skin. Rich flavor with hints of spice and red wine. Vary widely in size, but average 10 to 12 oz. each. Does well in colder temperatures. 74 days. Indeterminate, provide support. Won “Best of Show” at Carmel TomatoFest! The first tomatoes of the season are always a bit of an anti-climax. We wait all year for the fruit to come out of the back yard as opposed to some distant clime, and then take a bite. It's not as sweet as the memory, not as drippingly hot and gushy as the movie running through my brain. The first tomatoes aren't the best ones. That is all there is to it. I tend to pick them a little early, eager for a bite and am met with a disappointing crunch when there should be a mush. In a week or two, I won't be so impatient, the vines will be dripping with ripe fruit, and I will eat them three meals a day, going from scarcity to abundance in a flash. Soon, every slice of bread will be adorned with a smear of mayo (the junky kind, not the healthy kind. Sorry) a thick, red, juicy slice of tomato and a sprinkle of good salt. This will be all I eat for a while. I know it's coming. 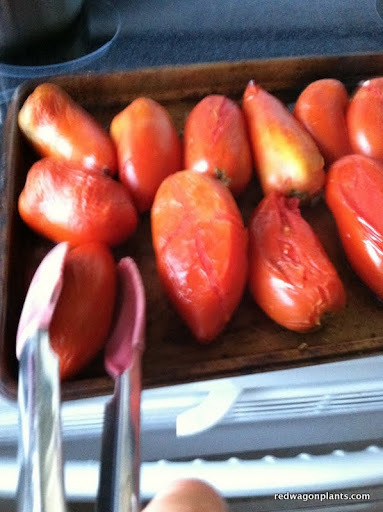 But for now, I decided to document the earlier tomatoes and taste them, giving them a ritualistic importance of sorts. I try to put blinders on in the face of their slight un-ripeneness and photograph them, carefully laid out on the counter. Soon there will be baskets of tomatoes, heaping, unnamed and tangled together. But for now. We will carefully label, taste, and report. Here goes. Pink Beauty is just an iconic tomato - it always perfectly shaped, blemish free and has an almost electric dark pink hue. The Purple Russians tend to crack a little, but nothing too detrimental (their good sides are showing for the photo shoot). The Juliet, as many of you know, is my favorite all-around tomato. It has huge yields of oval fruit that are great raw, for snacking, salads, sandwiches, and salsa (not too watery); but the real charm is that they work really well as a cooked sauce tomato too. The Viva Italia is a very pretty paste tomato - early and blemish free and very disease resistant. The Glacier is an heirloom, super early, does well in very cold climates (Huntington, Lincoln, Ripton - no problem), and is the one tomato you will be eating weeks before others ripen. All were slightly under-ripe and slightly lacked that "I've been baking in the hot sun" flavor and texture. We have had some rain the past couple of days, and the flavor is affected by that. But they were good - not middle of August good, but good. The Pink Beauty has a really nice balance of sweet and acid flavors, a slippery, silky texture and makes beautiful shiny slices. The Purple Russian was a winner, flavor wise and texture wise. It is juicy, especially for a paste tomato, and has the most buttery complex taste that lingers on the tongue and leaves me wanting more. The plants are nothing pretty - they always look shaggy and stringy somehow, so I have never gotten too excited about putting them in my garden, but customers rave about them, and now I know why. Sweet, unctuous and complex. A new favorite and you will hear me raving about this one in the greenhouse next year. It would be perfect raw or cooked, and I am sure any sauce made from these would be a deep purple red color. The Juliets were a little bland compared to the first two, but still full of good, bright flavor - lively on the tongue and a nice meaty texture. Viva Italia were lacking in distinctive flavor (a little too acidic for my taste), but in all fairness, they are much nicer when cooked. We will have to do another taste test with just paste tomatoes, cooked simply in some olive oil and lightly salted. The Glacier is cute as a button: plump little orbs, slightly mis-shapen and full humble darlingness. The flavor is great for an early tomato - they are a little bigger than a cherry tomato, can be sliced for salads or sandwiches or cooked down for a quick sauce. They tend to ripen 3 or 4 at a time, a nice feature since they are so small and just one of them won't take you far. I would put this at the top of the list for early tomatoes. But if you only have room for a couple of plants, there could be some better choices. 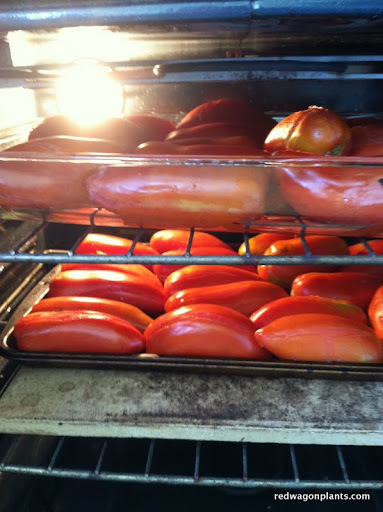 I would love to hear what you are loving or not loving in your tomato selections. Any varieties you want to recommend for next year? Any you think should be discontinued? Let us know. And we love pictures! I will do this taste test again, later, when the plants are loaded and the fruit is at peak flavor! Now that tomato planting weather is upon us, I want to write a little about some questions we often receive from customers. One of them is "When can I plant tomatoes?" Tomatoes are best planted when the soil is warm (night time temperatures are 50F or above) and all danger of frost has gone by. In Burlington that is generally the end of May or the first week in June. The best planting method for tomatoes involves digging a shallow trench and laying them in it. You can break off the leaves on the bottom 2/3 of the plant and bury the whole stem horizontally in the warm top layer of soil. The buried stem will turn into a huge and healthy root system. The top of the plant is gently bent upwards and soil is patted around the base. Tomatoes must be trellised for best results; it keeps the plant healthy, off the ground, and the fruit stays clean. •Remove suckers (new shoots that develop in the leaf axils) before they reach an inch in length. • Leave the first sucker that grows below the first flower cluster, removing all others below the first flower cluster; allow suckers above first flower cluster to grow. • Pinch off tops once plants reach a few inches above stake. • Use 4 ft. sturdy wooden stakes, with double stakes at end of each row for strength. • Set stakes six inches deep, one stake for every two plants, as soon as seedlings are transplanted. • Begin supporting tomato seedlings after they have set the first flower clusters. • Tie sturdy, untreated twine at one end of row, about 18” up from soil level. Weave twine between tomato plants, wrapping twice around each stake down the row. After reaching the end- stakes, weave twine back up the row in the opposite direction, alternating with the weave-pattern of the first strand so each plant stem is encircled by twine. • As plants grow, weave another layer of twine every 6-8 inches to keep plants well supported. Four layers of twine will support most varieties. Hope this information helps, and as always feel free to stop by our greenhouses where our staff can always talk to your about your tomato growing concerns. Happy gardening!